As we wrap up our last full time jet boating season we’re very conscious of the support we’ve received from our passengers over the years. Our passengers have been effusive in their thanks this year, with handshakes and hugs on the slipway and some lovely emails. So thank you, guys. It’s been terrific catching up with old friends (some of whom have been coming out with us for over 30 years!) and making new ones. We know you all want to know what’s happening with Venture Jet. These things take time but we’ll keep in touch with everyone via the blog and Facebook. This, according to this year’s passengers, is what we do 🙂 . Extracts from recent reviews: amazing boat, awesome wildlife, you may get wet. Sounds about right! A thrill ride, nature trail and history lesson bouncing on the rib of a very special boat. The boat looks similar to some of the other tour boats which leave from this jetty however this is where the similarities end. The boat is jet powered as opposed to conventional outboard and inboard screw props of the other tours. This makes it amazingly navigable and allows it access to places the other boats can’t get to. The captain and partner are extremely knowledgeable about the island, the sea, the local history. Many different bird species were spotted and their characteristics and habits explained in an accessible but informative way. The boat is amazing in speed, manoeuvrability and excitement, our eleven year old has not stopped raving about it since. The other boat trip passengers looked on enviously as we went in and out of caves, through narrow tidal passages and over reefs with strong tidal currents. Love this. Got wet. Saw wildlife. Laughed a lot. 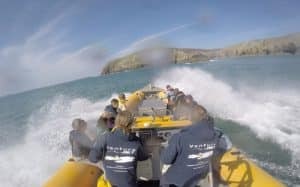 A great and exciting way to see the coastline, seals, porpoises, birds and interesting geology. The children (10 and 6) absolutely loved it. The smiles lasted for the whole 2hr trip (which isn’t always the case with teenagers). 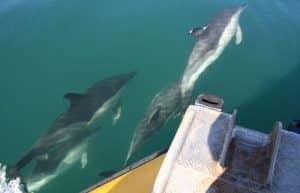 We had dolphins swimming next to our boat as well as seals and their pups…brilliant and well worth the money. 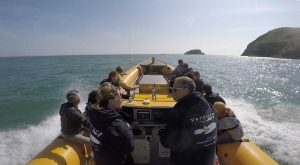 If you want an exciting, informative, entertaining trip round this beautiful coastline then these are your guys! Even our dog loved it. You need to book online or phone them. They do not have an office in St Davids. This was truly a fantastic thing to do, and I have done the Shotover Jet in New Zealand…this was equally as exciting and worth the money. A great combination of seeing and learning about local wildlife and some thrilling manoeuvres in the water. Even as someone who grew up in the St David’s area, I found it really interesting and wish I had done it sooner! You may get wet but it is worth every penny! The owners were able to show us lots of seals, crabs, birds etc and give us some adrenaline fuelled spins along the way! The local and wildlife knowledge was excellent and informative without being boring and over the top. Super adrenaline rush for the kids topped by seeing so many seals….so cute! We simply couldn’t fault it and would love to return, so please don’t give it up.